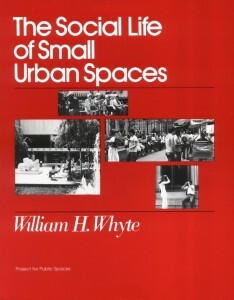 William Whyte’s efforts to better design New York City’s public spaces have greatly influenced studies in urban planning and development. It is often assumed that children play in the street because they lack playground space. But many children play in the streets because they like to. One of the best play areas we came across was a block on 101st Street in East Harlem. It had its problems, but it worked. The street itself was the play area. Adjoining stoops and fire escapes provided prime viewing across the street and were highly functional for mothers and older people. There were other factors at work, too, and, had we been more prescient, we could have saved ourselves a lot of time spent later looking at plazas. Though we did not know it then, this block had within it all the basic elements of a successful urban place. We discovered that some plazas, especially at lunchtime, attracted a lot of people. 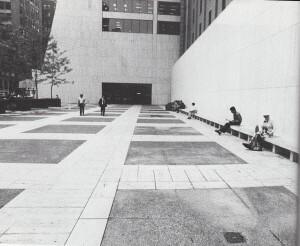 One, the plaza of the Seagram Building, was the place that helped give the city the idea for the plaza bonus. Built in 1958, this austerely elegant area had not been planned as a people’s plaza, but that is what it became. On a good day, there would be a hundred and fifty people sitting, sunbathing, picnicking, and shmoozing—idly gossiping, talking “nothing talk.” People also liked 77 Water Street, known as “swingers’ plaza” because of the young crowd that populated it. But on most plazas, we didn’t see many people. The plazas weren’t used for much except walking across. In the middle of the lunch hour on a beautiful, sunny day the number of people sitting on plazas averaged four per 1,000 square feet of space—an extraordinarily low figure for so dense a center. The tightest-knit CBD (central business district) anywhere contained a surprising amount of open space that was relatively empty and unused. If places like Seagram’s and 77 Water Street could work so well, why not the others? The city was being had. For the millions of dollars of extra space it was handing out to builders, it had every right to demand much better plazas in return. But zoning is certainly not the ideal way to achieve the better design of spaces. It ought to be done for its own sake. For economics alone, it makes sense. An enormous expenditure of design expertise, and of travertine and steel, went into the creation of the many really bum office-building plazas around the country. To what end? As this manual will detail, it is far easier, simpler to create spaces that work for people than those that do not— and a tremendous difference it can make to the life of a city.